Have you ever sat on a recipe for a really long time? These Olives En Croute was a recipe that sat in the back of my mind for years. Yes, years. I have been on an email list for well over 20 years now. This was one recipe that I had been meaning to make. 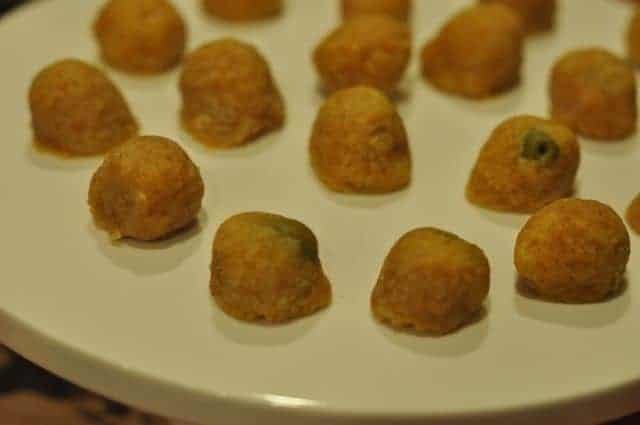 So, first let me tell you about this wonderful recipe, these olives are baked but they are encrusted with a lovely buttery, cheesy shell, that has a bit of spice. You can make these ahead of time, in fact you need to, pop them in your freezer and then bake them when you are ready to serve them. Are they the perfect appetizer for your cocktail party, yes. Why did I wait so long? I don’t know, these olives appeared at many wedding receptions, parties, and other events. Everyone raved about this recipe. When I made them, everyone raved about the recipe. So I think my takeaway from this recipe is to go ahead and make that recipe you have always been wanting to make. There is no reason not make that one dish you have been holding out on. I know for me, this recipe is a keeper, and is going to be making repeated appearances at gatherings at my house. Olives En Croute are a great appetizer, olives are surrounded with cheese. Drain olives well. Place on paper towels and pat dry with more paper towels. They will need to be very well drained and dry or the crust will not stick to the olives. In a bowl, combine butter, cayenne, flour, and cheddar. You will need to use your hands to mix these together to form a dough. It will take a while to do this. Everything should be well blended. Pinch off a piece of dough about the size of a marble. Flatten it in your palm. Place the dry olive in the middle and shape the dough around it, making sure all of the olive is covered. Place on a baking sheet. Continue until all of the olives are rolled. Freeze until solid, then transfer to a plastic bag. Store in the freezer until ready to use. To bake: Place still frozen olives on a baking sheet. Bake in a preheated 400-degree oven for about 15 minutes or until lightly brown. These do best if frozen before baking. So be sure to put them frozen into the oven when you bake them. This is so funny! I made these cheese/olive appetizers over 35 years ago, once only. I lost the recipe and thought many times about trying to locate one again. I just found one on allrecipes.com about a week ago. These are truly delicious and I have dreamed about them for 35 years. I am making them for the Super Bowl tomorrow. Wow! Well over 20 years on an email list? Care to tell us how that happened when fewer than 10% of us had computers back then? You must have been a pioneer! I can’t account for everyone on the list, but I was in college and there were main frames and smaller networks that we were on. I personally was on a VAX network. Then I switched to the MCI phone network, and they that this program that you could send out email through the dial up phone connection. I have loved being on the mailing list 😉 I still have some print outs from the 90s in a notebook. If you want to join, let me know! I have been making this recipe for over 40yrs. Always a big winner! I hate that I didn’t make this one sooner. These are so good.